The Nikon D700 is a professional grade full-frame DSLR camera. 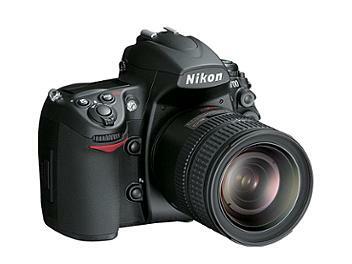 It uses the same 12.1 megapixel FX CMOS image sensor as the Nikon D3. Type G or D AF Nikkor: All functions supported (PC Micro-Nikkor does not support some functions). IX Nikkor lenses not supported. Other AF Nikkor: All functions supported except 3D Color Matrix Metering II. Lenses for F3AF not supported. Dimensions (W x H x D) : Approx. 147 x 123 x 77 mm/5.8 x 4.8 x 3.0 in. What can I say that hasn't been said? One of the best fullframe cameras for everybody excep professionals (they would use D3s or larger format). I've tested quite a few Canons but none of them was so easy to use or so customisable then D700. Since it's sensor is not so packed with pixels it delivers great ISO performance and dynamic range. Camera is fast, very tough and works with virtually all Nikon lens. It really pays when you dedicate time to set it exactly to your needs since it offers a lot of options plus it has one of the best 51point autofocus mechanism; Canon put only and old 19 point one in it's 5D mark 2. The only thing D700 lacks is video, but no DSLR has produced a sufficient video system yet and if you don't need it - D700 is the way to go.